Japanese Episode DP 029: "Satoshi and Hikari! A Tag Battle is OK!?" American Episode 493: "The Champ Twins!" Our heroes are continuing their journey when they come across a camp where a lot of tough trainers have gathered. Satoshi, ready for a challenge, seeks out the strongest trainer there. Eventually, he comes across a pair of twins named Isaki and Isamu. The brothers challenge Satoshi to a tag battle, so Hikari volunteers to be his partner. The battle between the brothers' Alligates and Magmarashi and our heroes' Naetle and Potchama begins well enough, but before long Potchama and Naetle start to get in each other's way. The two pokemon end up spending most of the battle fighting amongst themselves, so their trainers begin to bicker as well. Isaki and Isamu are able to claim victory, leaving Satoshi and Hikari to continue their argument back at the camp. Pikachu, who had grown tired of the constant fighting, uses an electric attack to knock some sense into the trainers' pokemon which, in turn, makes the trainers stop fighting as well. The duo apologizes and decide to try their hand at a tag battle again, so they track down Isaki and Isamu and ask for a rematch. After an interruption by the Rocket-Dan is taken care of, the rematch begins. 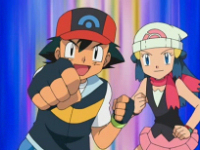 This time, Satoshi and Hikari are more in-sync and are able to combine their pokemon's attacks to pull through with a victory. Now that our heroes have a better understanding of how to work together, they press forward to their next adventure. The Houen version of this episode was better. Not that this was a bad one or anything, because there were certainly a lot of things to like about this episode. But...it's just one of those episodes where you watch it and get this déjà vu feeling. The brothers aren't nearly as interesting as Oscar and Andrew were, and the lack of any type of "battle of the sexes" thing makes the Houen version superior. On the dub side of things...PUSA keeps ten pieces of Japanese music in this episode! They'll probably "make up for it" by only keeping two pieces in the next handful of episodes, so I'm not going to get too excited. Other random observations include the nickname "The Champ Twins." The duo didn't have a nickname in the Japanese version (they were just known as "the brothers, Isaki and Isamu"), but I guess PUSA couldn't resist punching 4Kids in the gut. "The Champ Twins" have a catchphrase in the Japanese version (yosha!) that goes mostly untranslated in the dub. The word, which is the equivalent of saying "yeah!," is said about a dozen times in the Japanese version and actually teeters on the line between being humorously absurd and annoying. PUSA translates it a few times ("oofa!" "doofa!" is my least favorite one they use), but most of the time they just sort of ignore it. Also, it looks like PUSA's settled on "no need to worry" as a translation for Hikari's "daijoubu!" It's about time. Finally, Yuuka never tells the cameraman (who's unnamed in the original version) that she'll send him "back to the mailroom." Originally, she just yells at him to stop hitting her in the head with the mike. Toward the end of the music, the Japanese version plays two vocal songs. Both songs are, of course, removed in the dub. The songs played, for those of you who are curious, are Pokemon Symphonic Medley (it plays from the start of the rematch until right before our heroes' comeback) and Ready Go! (it plays from the point Naetle uses its first Razor Leaf until the end of the battle).